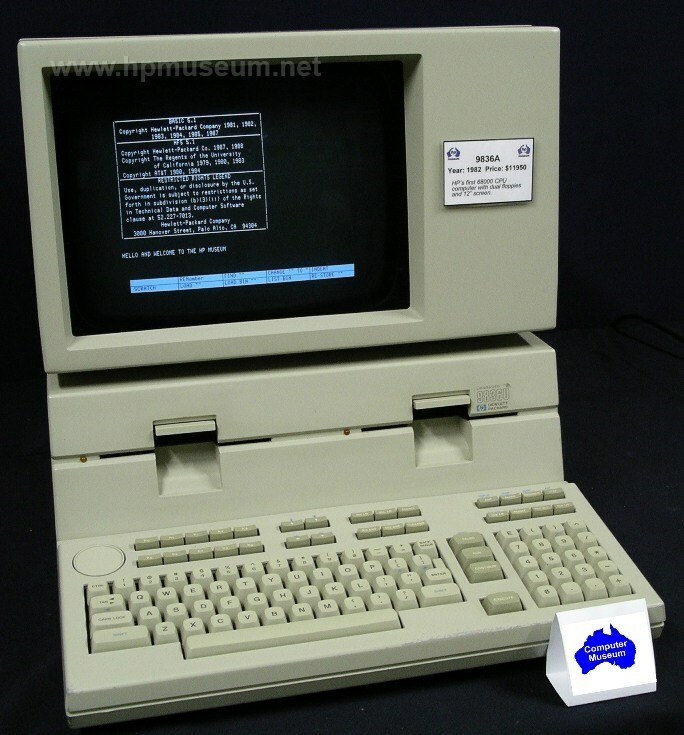 The 9836A was introduced at the end of 1981 and featured a large, 12.2 inch (390 x 512 dot resolution) screen and dual 5.25 inch floppy drives. It was the design engineering computer of the 200 Series. 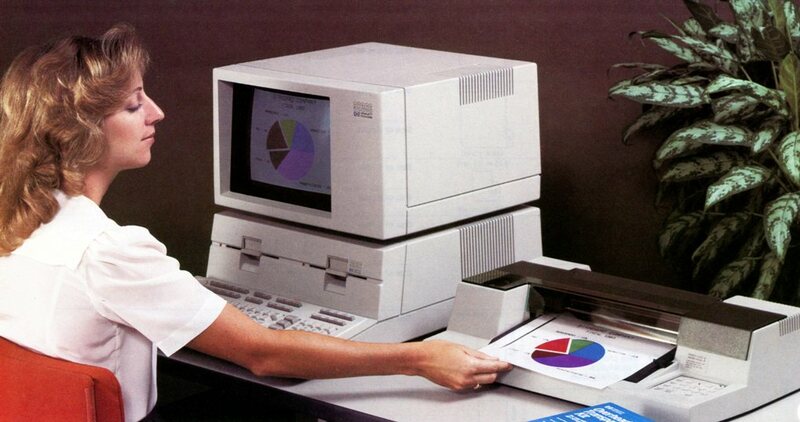 The 9836C arrived in April of 1983 and came with a color monitor ($15,140). Subsequent models included the 9836U (with 12.5 MHz processor and HP-UX capable), and the 9836CU (color monitor version of the 9836U). Additional part numbers avaialble were the 9836S, 9836CS, 9836T and 9836CT. These models comprised base units bundled with additional memory and/or language capability. The 9836 family was also known as the 200 Series Model 36, 9000 Model 236 and 9000/236. Click here to view a 9 second video of the RIPPLES file that demonstrates the color pallette for the 9836C (1.5 MB). 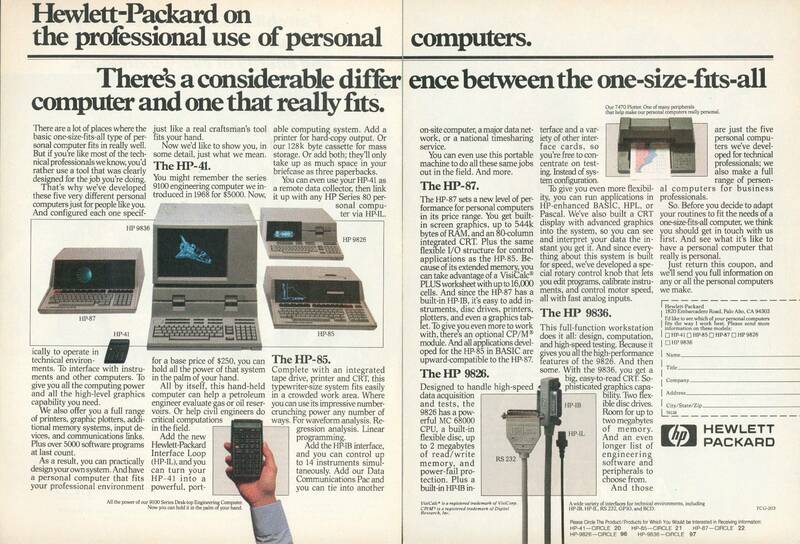 In 1983, HP introduced a detachable keyboard option for the 9826A and 9836. This option (G3) was priced at $300 and only available in Europe. Be sure to visit Olivier De Smet's emulator project for 200 Series computers. It includes emulations for the 9836C. One of my favorite features of this classic machine is its flat-top monitor. 9836 users were free to place almost any other desktop item on top of their 9836 monitor (stapler, telephone, inbox, etc). 267X printers often occupied this perch). The "net desk space" taken up by the 9836 was really only that amount taken up by its keyboard. This was less than the space required by over 99% of desktop personal computers sold in 2005. Despite its size and complexity, the 9836 is a fairly reliable computer. Of the five units we have processed at the museum, all system units worked: one had an dead monitor (monochrome). One of the museum's 9836C had a monitor with a dead red gun (but working blue and green guns). Error 96 - The built-in floppy disc drives often need some TLC to bring back to functioning order. The grease lubricant used on the mechanical parts of the drive can cause those parts to stick with age - this is particularly common for floppy drives made by Magnetic Peripherals Inc where a damping weight near the head carriage gets stuck in its sticky grease. If either drive has this issue, the 9836 will fail its power on test with an error 96 on the processor LEDs (or code 16 from the speaker beeps). This can be solved by cleaning with alcohol and replacing the grease with silicon oil. Dominique Berget has also succeeded in replacing the floppy discs within the 9836 with Tandon TM100-2A drives, one coming from an IBM PC-XT and the other coming from HP 9130A. If you have a 9836 that will not boot from one of its internal floppy drives, just boot the machine from an external, HP-IB-connected 9121 or 9122 floppy drive. 9836s with bootrom 3.0 and higher (this includes over 95% of 9836s out there) will automatically boot from an external disc drive, connected via HP-IB. If your 9836 gives you a strange, one-line error message at power-up (like "memory failure at XXXXXX"), it may just mean that the internal PCBs are not seated snuggly enough. To fix this problem, remove the top case, unplug all of the pluggable PCBs (including the expansion slot backplane) and reseat them snuggly. If your 9836 has defective boot ROMs (ROMs U88 and U57 on CPU board 09826-66516), you can replace them with two 27c256 UVPROMs. Click on the Product Documentation link below to get the binary contents of the replacement PROMs and a sheet that describes the modificaton required to connect the replacement PROMs to the CPU board.